England’s 2019 FIFA Women’s World Cup qualifier against Kazakhstan has sold out. The Lionesses will host their visitors at the Weston Homes Community Stadium in Colchester on Tuesday 28 November (7.05pm KO). The match is live on BBC Two and BBC Radio 5Live Sports Extra. England have a perfect record in Group 1 qualifying so far, with two wins out of two. They beat Russia 6-0 in September and then Bosnia & Herzegovina 4-0 in front of a sold-out stadium in Walsall on Friday [24 November]. 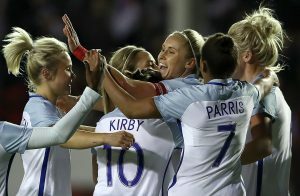 Captain Steph Houghton said: “To play in two sold-out stadiums in a row means so much to the team and shows what fantastic supporters we have. “The fact that 20,000 people will come and watch us play over a weekend shows just how far the women’s game has come. We’ve always said we want to inspire the next generation – whether that’s to play or watch football. After Kazakhstan, the Lionesses’ next qualifier is against Wales at Southampton’s St. Mary’s Stadium on Friday 6 April 2018 (7pm KO). Tickets are on sale now, with an early bird offer for adult tickets purchased up to 31 January 2018 (standard price £10). Children and concessions tickets are just £1 and group booking and Charter Standard discounts apply.